Hand waxing and orbital polisher waxing produce different results. They both have their merits, though– and the decision to use them will ultimately rest on personal preference. However, orbital polishers save time and produce more consistent results. Orbital polishers have been around for several decades, but they are now easier to use and manipulate. The random motion orbital polisher, also known as a dual-action polisher or buffer, wards against the intense pressure of that rotary polisher may cause as pressure can result in scratches or swirls in the paint. While moving randomly, it generates friction to lift off residue or potential contaminants. In fact, random motion orbital polishers can be used for intensive buffing, moderate polishing, or end-process waxing. The key, apart from good technique, is cleanliness. Before beginning the waxing process, owners should ensure their vehicles are clean and dry. The orbital polisher can also be used for prepping the surface for wax. Indeed, it should be used if the car has not been polished in quite some time or if it has surface damage. Wax (even high-quality wax) can only bring out the shine and protect the paint if the oxidation and grime underneath is gone. Hand waxing has been known to leave residue and streaks on the paint. This is not always apparent until the vehicle travels out into bright sunshine and the unsightly results appear. A steady hand and patience can help you to avoid these issues. However, a random motion orbital polisher creates less work and a better finish. Clean foam pads are also necessary for the best auto detail results. Orbital polisher foam pads should always be fresh and dry; a stack of these pads will ensure the process doesn’t turn ugly. 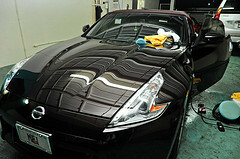 Trusted (but not necessarily expensive) waxing products also bring out the sheen on a car body. The wax should be applied gently in small stages, working panel by panel to ensure that the wax has enough time to set yet doesn’t leave behind caked on residue. A pulsing motion for initial application is followed by steady random motion that generates the friction to seal in the wax. Wax removal is the final step to bring that shining ride to full fruition. Don’t have the time or inclination to wax? Mr. Clean Car Wash can bring out the protection and shine with expert care and our auto detail services. Reveal the shine in your ride today.